Beginning on December 7, five statesDelaware, Pennsylvania, New Jersey, Georgia, and Connecticutratified it in quick succession. However, other states, especially Massachusetts, opposed the document, as it failed to reserve undelegated powers to the states and lacked constitutional protection of basic political rights, such as freedom of speech, religion, and the press. 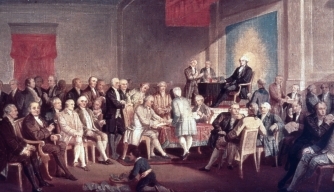 In February 1788, a compromise was reached under which Massachusetts and other states would agree to ratify the document with the assurance that amendments would be immediately proposed. The Constitution was thus narrowly ratified in Massachusetts, followed by Maryland and South Carolina. On June 21, 1788, New Hampshire became the ninth state to ratify the document, and it was subsequently agreed that government under the U.S. Constitution would begin on March 4, 1789. In June, Virginia ratified the Constitution, followed by New York in July. On September 25, 1789, the first Congress of the United States adopted 12 amendments to the U.S. Constitutionthe Bill of Rightsand sent them to the states for ratification. Ten of these amendments were ratified in 1791. In November 1789, North Carolina became the 12th state to ratify the U.S. Constitution. Rhode Island, which opposed federal control of currency and was critical of compromise on the issue of slavery, resisted ratifying the Constitution until the U.S. government threatened to sever commercial relations with the state. On May 29, 1790, Rhode Island voted by two votes to ratify the document, and the last of the original 13 colonies joined the United States. Today the U.S. Constitution is the oldest written constitution in operation in the world. Signers to the document are currently spinning in their graves. Flim at 11. I wonder if there’s a single student at Evergreen State College who knows this. I wonder how many students at Harvard know it. Certainly Google doesn’t give a s* about it. And our job is the restoration of our Free Constitutional republic by dismantling the 80% unconstitutional portion of the federal government, putting them back into their constitutional cage with lock and key, and setting back in place the Constitution as written and originally understood and intended as a watchdog against the feds breaking out of their cage. King John signing Magna Carta, June 15, 1215 A.D.
England was invaded by Dane Vikings from Scandinavia who destroyed churches, libraries and defeated all opposition except for 23-year-old King Alfred. Forced into the swampy, tidal marshes of Somerset, Alfred, King of the Anglos and Saxons, began a resistance movement in 878 A.D.
For the Lord is our defense, Jesu defend. The Lord has made my hands to war and my fingers to fight. But He will defend us from the arrow in the night. For the Lord is our defense, Jesus defend. Alfred drove the Danes back to Englands coastal area of East Anglia, where he gave their King Guthrum the choice of sailing back to Scandinavia or converting to Christianity. He chose the latter. King Alfred the Great was credited with beginning the University of Oxford. He included in the preface of his Law Code the Ten Commandments, passages of the book of Exodus, Christs Sermon on the Mount, and the Acts of the Apostles. Around the year 911 A.D., on the opposite side of the English Channel, Norse Vikings, called Normans, invaded an area that came to be called Normandy, in northern France. The Normans eventually became Christians. In 1066, the Norman King, William the Conqueror, crossed the English Channel and invaded England. William the Norman replaced King Alfreds law with a feudal system of government which concentrated power into the hands of the king. This continued in England till the Magna Carta. While Englands King Richard the Lionheart was away fighting the Muslims in the Third Crusade, his brother John was left in charge. The legend of Robinhood is considered to have originated during this time period. Richard the Lionheart returned to England in 1192, but was killed in 1199, leaving King John to rule. Though the Normans had originally come from Normandy over a century earlier, King John lost Normandy and almost all the other English possessions to King Philip II of France by 1205. Englands barons became so frustrated by this loss and by King Johns absolute and arbitrary despotism that 25 of the leading barons surrounded him on the plains of Runnymede. There they forced him to sign the Magna Carta, the Great Charter of English Liberties, on June 15, 1215. The Magna Carta began the process of redefining governments purpose from dominating peoples lives into guaranteeing individual rights, culminating in the U.S. Constitution. Political power changed from top-down to bottom-up. Sir Edwin Cokes book, Institutes on the Laws of England, which emphasized the importance of the Magna Carta, was studied by John Adams, Thomas Jefferson and James Madison. Discover more of Bill Federers eye-opening books and videos in the WND Superstore! If King John did not adhere to the Magna Carta, the 25 barons promised to levy war against him. Acknowledging Americas debt to the Magna Carta, the American Bar Association erected a monument to it in England at Runnymede in 1957. The Magna Carta was signed by King John, the younger brother of Richard the Lionheart, who was renown for fighting the Muslims in the Third Crusade. If only. Somebody tell scotus. The first of these would have established how members of the House of Representatives would be apportioned to the states. It was drafted to ensure that members of the House would continue to represent small constituencies even as the general population grew, small enough that Representatives would not be too far removed from the concerns of citizens. In addition, keeping the House of Representatives from being too small was thought to protect against its becoming a kind of oligarchy. Congress did send this amendment to the states, but the number of states that ratified it was just short of the number needed. Although the proposed amendment did not become law, Congressional apportionment is nevertheless grounded in the Constitution (Article 1, Section 2, Paragraph 3) and the total number of members of the House of Representatives is set by federal statute (currently at 435). The second of Madison’s 12 amendments forbade Congress from giving itself a pay raise: Congress could vote for a raise but it would only apply from the beginning of the next Congress. This amendment also failed to gather the required number of state ratifications in the years after it was introduced. In 1982, however, Gregory Watson, a university student doing research for a government class, ran across a description of this amendment and realized that it remained “alive” because it had included no language in it about a window of time in which it had to gain the needed number of state ratifications. Watson organized a successful effort to lobby various state legislatures, seeking their ratification of the amendment. As a result, the needed number was eventually reached and this amendment, first proposed in 1789, became the 27th (and most recent) amendment to the U.S. Constitution in 1992.